Raccoon Removal or Raccoon problems in Lemont, Illinois. Lemont Illinois is situated along the historic I&M canal and Des Plaines River with acres of wooded forests and river bottoms. Raccoon populations thrive in this ecosystem. The adaptable raccoon will live and raise their young in man-made structures that often times are your homes. I can handle all raccoon trapping services in Lemont, Illinois. In addition, I provide raccoon damage repairs to your home or building. Contact me at (630)416-9920-E-mail appointment request. Female skunks are known for large litters of young in spring. Their presence under your home/building is usually detected once they have sprayed. Besides getting under your porch, deck or sidewalk, they will rip up your yard in late summer looking for beetle grubs. For all of your skunk trapping/control services in Lemont, Illinois call (630)416-9920/e-mail a request at nuisancewildlifetrapping.com. Tree climbing experts, squirrels will enter homes and buildings by jumping off over grown branches. Like other rodents, squirrels are constantly sharpening their teeth by gnawing. They damage the woodwork of structures by this action and will raise their families once inside. I trap squirrels in Lemont, Illinois and can advise you on how to keep them off your building. Send me an e-mail from nuisancewildlifetrapping.com or reach me at (630)416-9920. Bats are attracted to the millions of insects along the I&M Canal and Des Plaines River. Sometimes, bats will make colonies in buildings. They are able to squeeze through cracks and crevices where they will make their roosts. Extremely beneficial because of their appetite for flying insects, bats are protected and can’t be harmed. Bat guano can accumulate and is concern for health issues. A strong odor of ammonia is present as well. I have bat eviction devices that allow bats to exit and be unable to get back inside. Effective and safe bat eviction /removal for buildings in Lemont Illinois can be found at nuisancewildlifetrapping.com or ring me (630) 416-9920. You may be hearing fluttering and bird noises from within the ceilings or walls of your home. Don’t put up with the smells, noises and health issues caused by a bird infestation. We remove birds and nests. In addition, Nuisance Wildlife Control has the expertise to clean, disinfect and install a permanent barrier to keep unwanted birds out. Solutions to bird infestations or birds inside vents in Lemont, Illinois is a phone call away at (630) 416-9920 or get an e-mail to us Setup An Appointment Our Contact Page. Jerry did a great job getting rid of a smelly skunk situation at our school. Quick response, very professional and thorough. Successful skunk trapping and removal in Lemont , IL. Skunk trapping and removal in Lemont , IL. On going successful skunk trapping and removal in Lemont , IL. 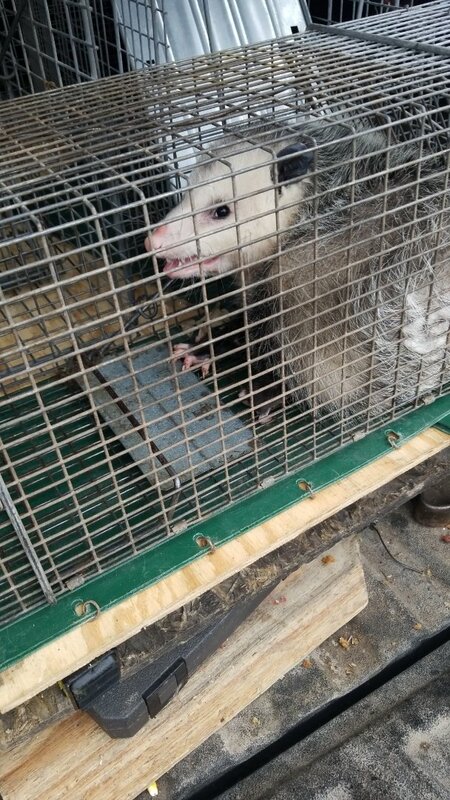 Successful opposum trapping and removal in Lemont , IL. Continued successful squirrel trapping and removal in Lemont , IL. Professionsl Skunk trapping and removal in Lemont ,IL. Successful squirrel trapping and removal in Lemont , IL.